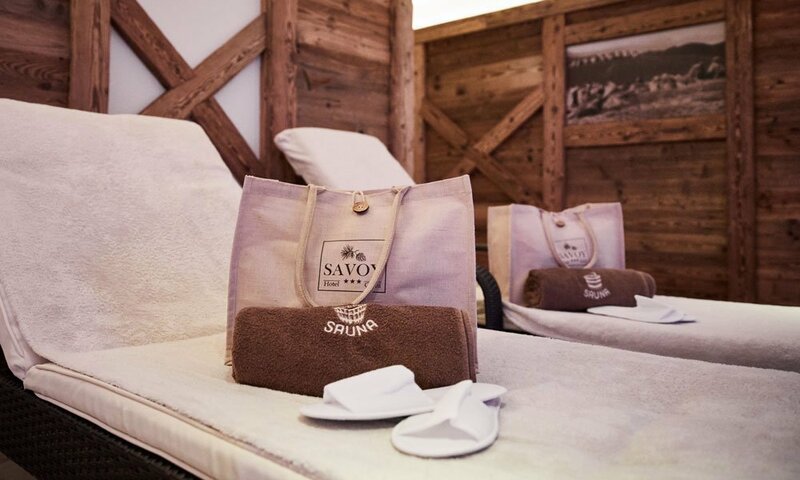 Our wellness Hotel Garni Savoy in Castelrotto is nestled in a picturesque landscape at the foot of Mount Sciliar – the landmark of the Dolomites. 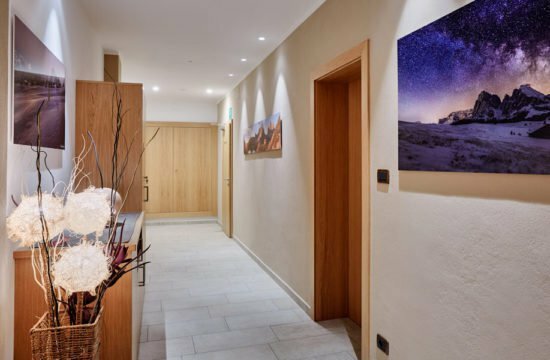 You may leave your car in our covered garage or in the parking lot in front of the hotel, because it is just 5 minutes’ walk to the village, and thus, to supermarkets, a pharmacy and other shops. The Fill family owns the hotel since more than 30 years. 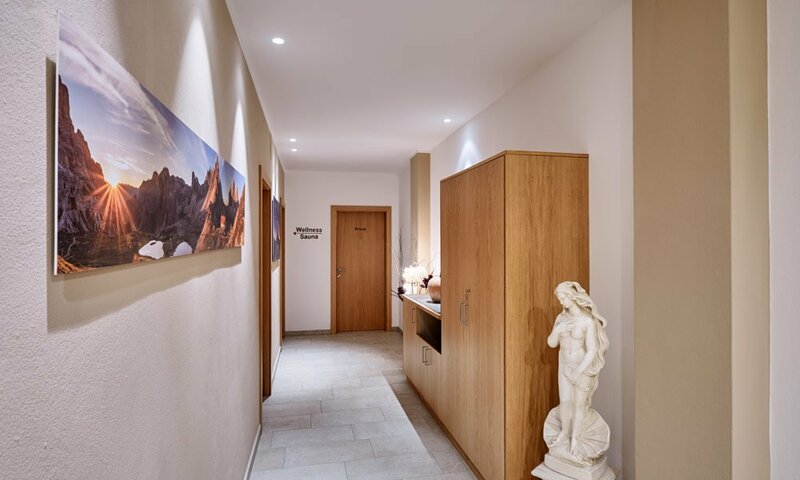 Anita and Hilde Fill will welcome you personally at the Hotel Garni Savoy and assist you during your stay with good advice and practical tips. 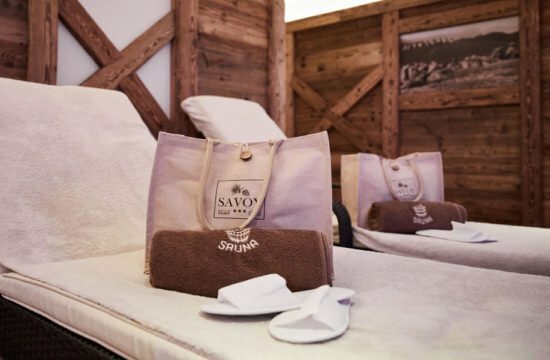 You will be inspired by the genuine South Tyrolean hospitality and enjoy the ambience of the HotelGarni Savoy. 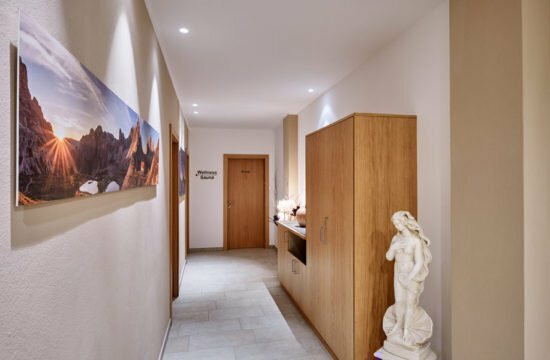 The familiar atmosphere will make sure that you arrive as a guest and leave as a friend, as so many regular guests have done for over 30 years. 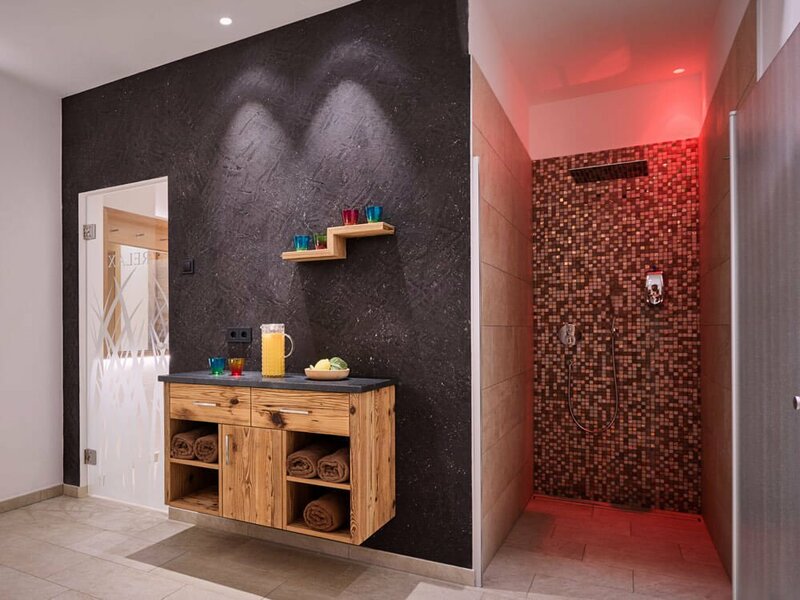 In our small and peaceful spa oasis with indoor pool and sauna, you may leave your everyday life behind. Comfortable loungers and soft lighting create a comfortable ambience. Rest and relaxation for body and soul awaits you on the inviting sun terrace at the Hotel Garni Savoy. Here, you may enjoy the soothing rays of the sun and work on a healthy tan; or you may visit the sauna and boost your immune system. 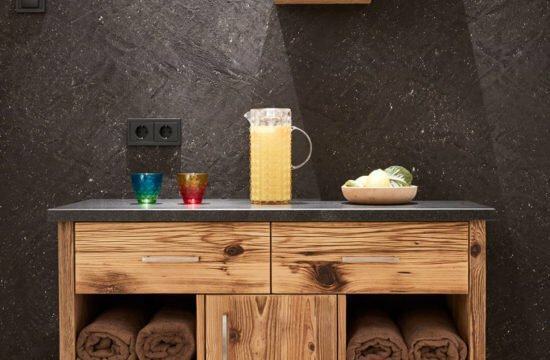 After a visit to our cosy sauna, a refreshing orange juice is ready for you. You will find peace and relaxation for body and mind on the large sun terrace. Here you can enjoy the warming sunbeams and get a healthy tan. In the Dolomites, you don’t just want to switch off from everyday life, but regenerate and vitalise yourself intensively? 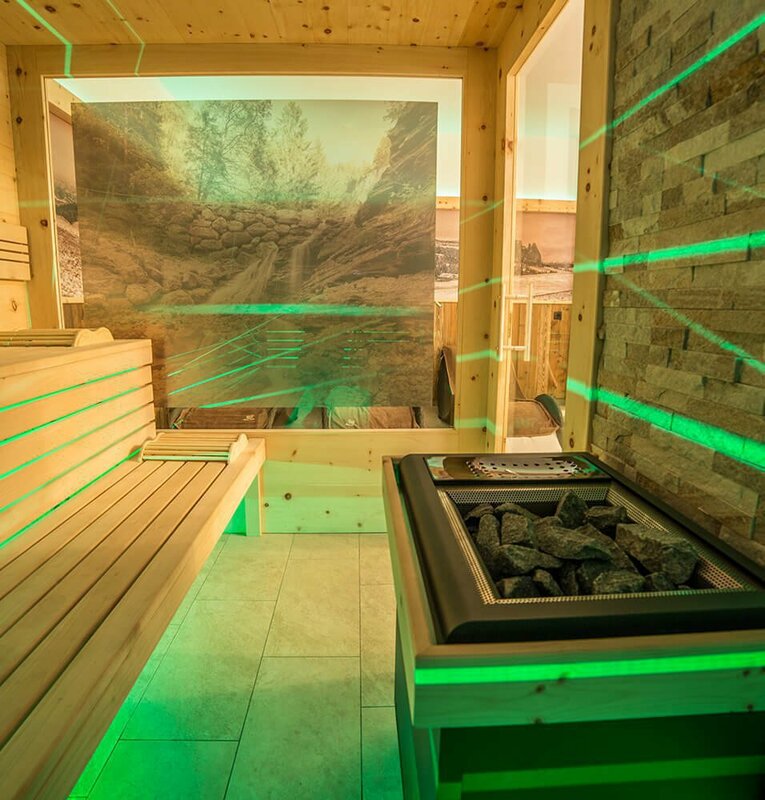 Then visit our newly built oasis of peace with a generous sauna landscape on the Alpe di Siusi. 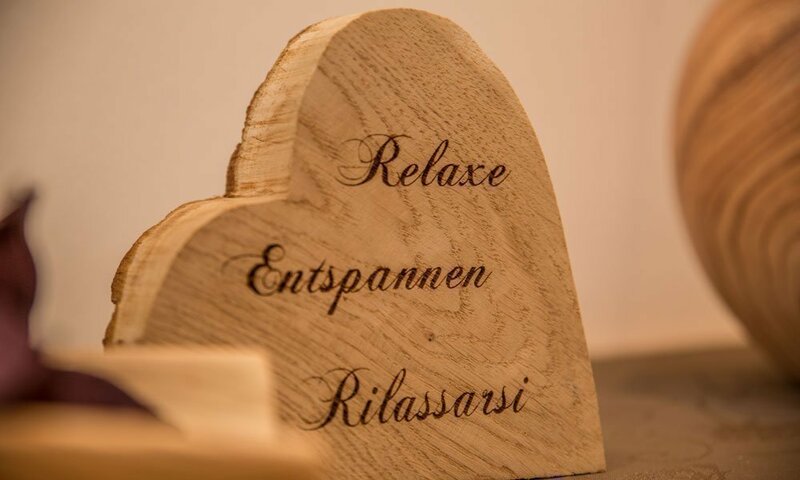 In our Finnish sauna or our bio-sauna you sweat out everything that burdens you in winter. 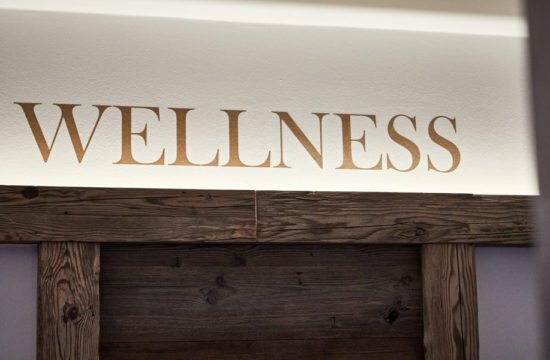 The immune system is stimulated during wellness on the Alpe di Siusi and a pleasant energy boost makes you fit for your next trip to the mountains. 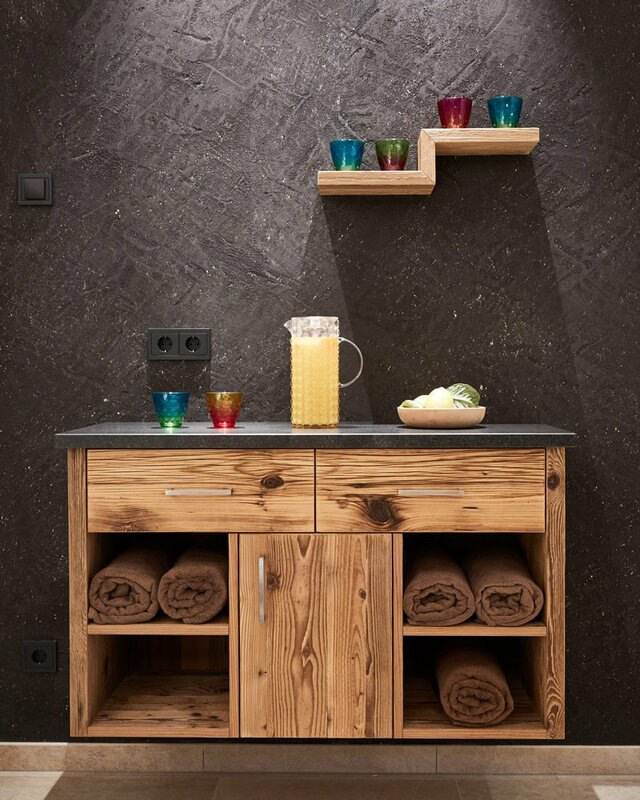 In our saunas – Organic or Finnish -, every day, a new relaxing or stimulating fragrance awaits you: stone pine, laces, lime, blood orange, apple mint, strawberry, alpine herbs and many more. 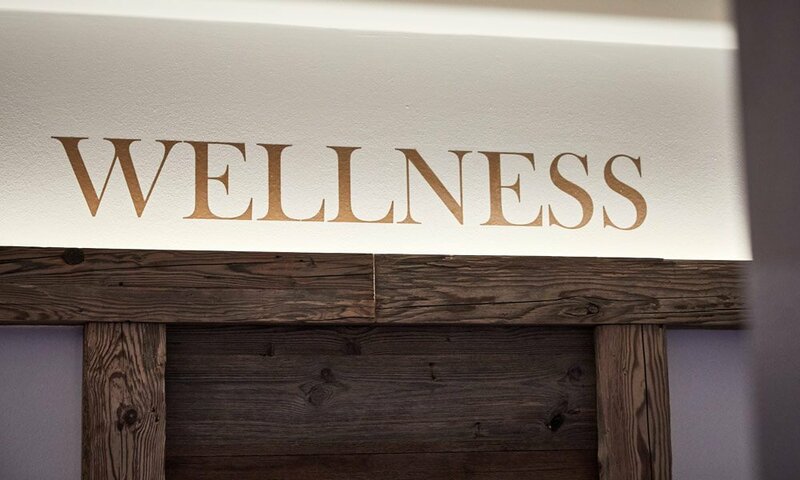 Our wellness hotel in Castelrotto offers you a new stone pine sauna. 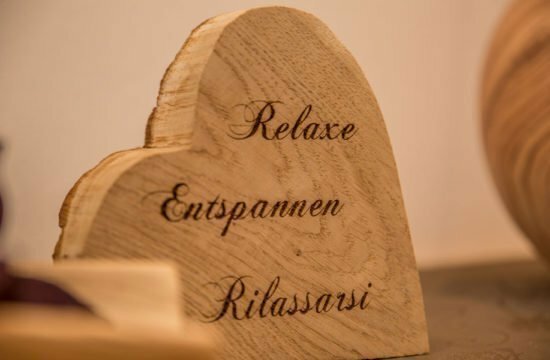 It relaxes, lowers blood pressure with its very special scent, exudes a feel-good ambiance and promotes a relaxed sleep – this has already been confirmed by many guests. 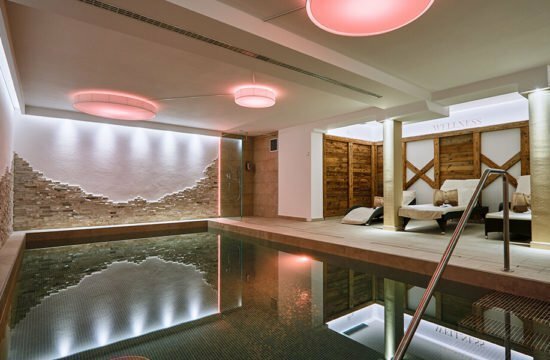 This is what Wellness at Alpe di Siusi/South Tyrol should look like! The resins and essential oils in the wood spread their soothing scent already during the heating process and will lower the heart rate. 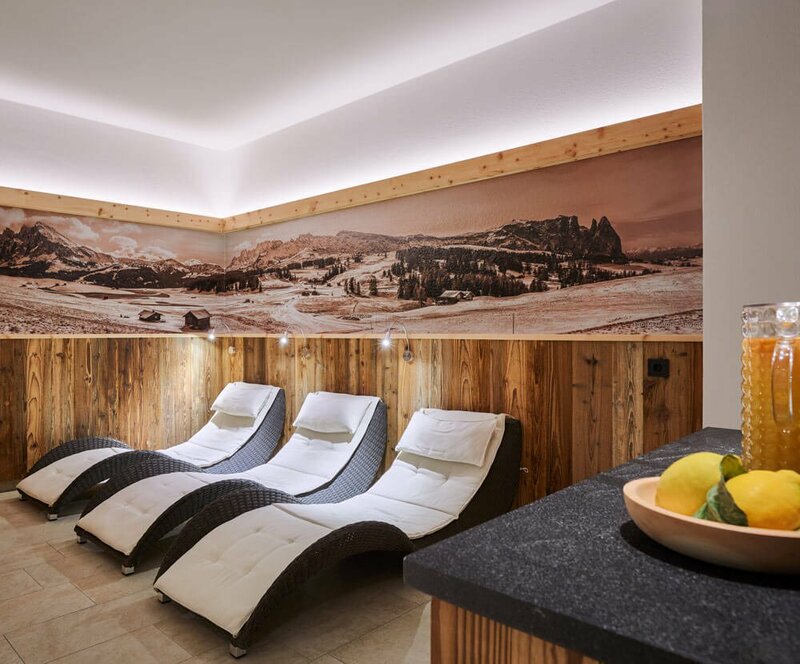 After a relaxing saunas session, you may rest and unwind in the relaxation room on soft loungers and mentally prepare yourself for your next hike in the Dolomites. Relax in soft lighting and light music. 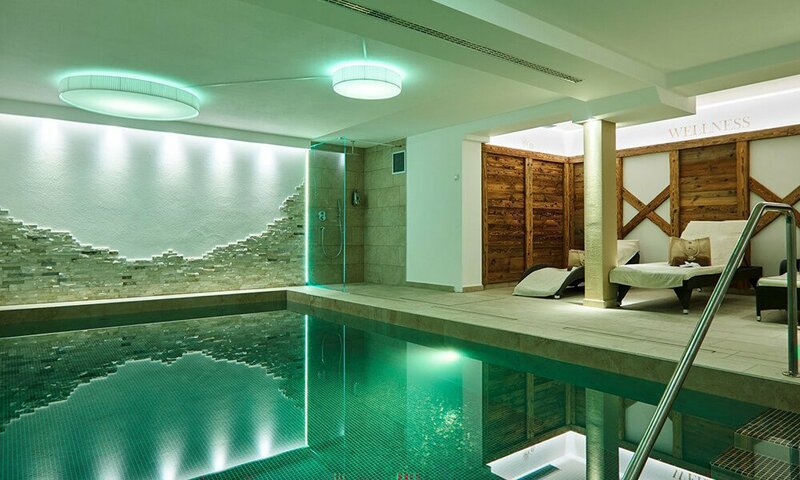 Wellness near Alpe di Siusi is simply wonderful! 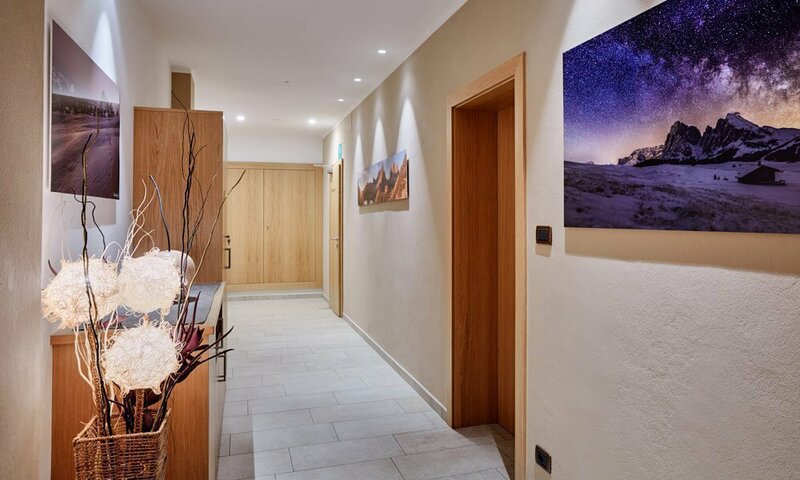 Unwind in our wellness hotel in Castelrotto after an exciting day in the Dolomites/South Tyrol. After a long hike or a bike tour: Here, you may wonderfully relax and simply be – a blessing for body and mind. Furthermore, a refreshing orange juice is ready for you. In the winter, after great fun on the slopes and in the snow, you may warm up and take care of your joints. 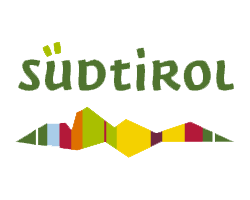 Thus, you may experience a relaxed holiday in South Tyrol and can recharge your batteries for everyday life at home. In combination with the glorious nature, the clean air and the mild climate, you will experience a stay that does good to body and mind. Our relaxation and resting area is open for you every day from 3pm to 8pm. 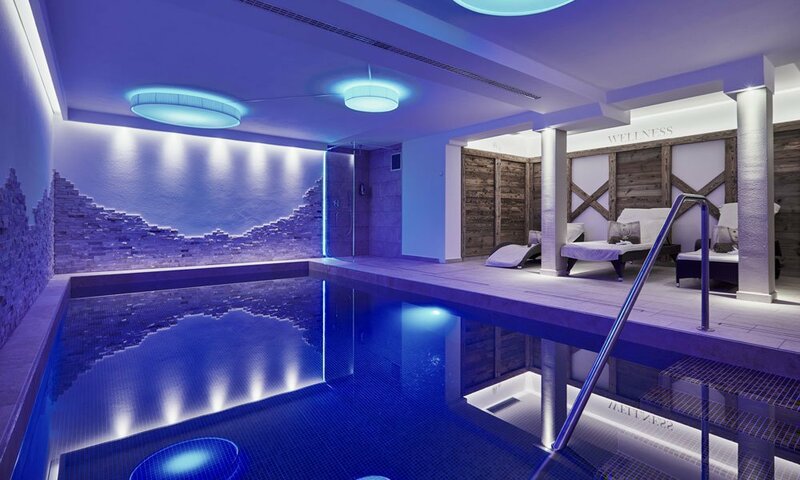 In 2018, we have fully renovated our indoor pool. Now, you’ll find wide, cast stairs and exciting, coloured lighting. 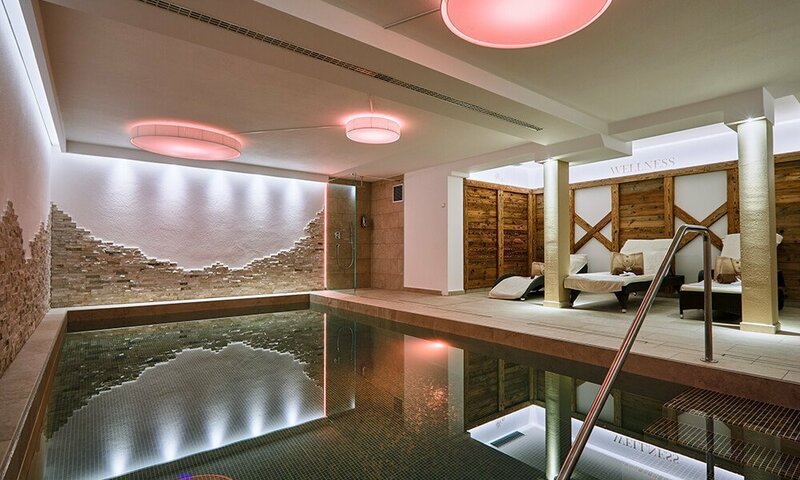 This gets the body going and turns swimming at the Hotel Savoy into an experience. 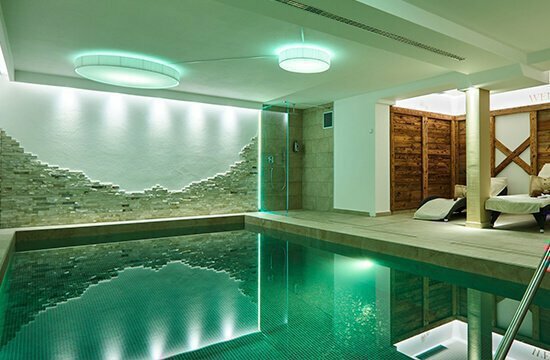 Book your spa holiday in Castelrotto now!